As we see with His eyes into the spiritual realm, we begin to desire the same things He does. Our heart becomes more compassionate, our mind more discerning. We are filled with faith and want to participate in bringing about His will. This is the point we’ve now come to. One of the ways we participate with Him is through prayer. Earlier in our spiritual journey, we prayed as we saw fit, according to our desires. But that only gets us so far. Eventually prayers for our will separate us from participating in bringing about God’s true purposes. Now that our mind and perspective are being transformed, we can pray according to His will. God has now brought us further into His tabernacle — to the Altar of Incense. Now He teaches us to pray according to His will. 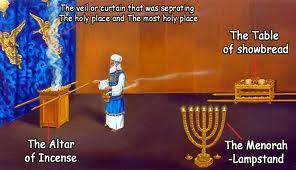 This shows us that the smoke of the burning incense is what is mixed with our prayers before they rise to God. Just like the smoke from the altar, our prayers are to be a perpetual offering before the Lord, morning and night. To “pray without ceasing” is our constant communication with God in all we do, throughout our days and evenings. This keeps us close to Him, so He can guide our steps, our words, our actions and we can glorify Him in all we do. This is how we participate as a partner in his kingdom. This is true intercession, knowing the Father’s business and participating in the spiritual realm to bring about his purposes on earth. This is the ministry of the Altar of Incense. However, behind the Altar of Incense in the tabernacle, there’s a thick curtain, blocking our way from progressing any further. Why? We’ll answer that in our next blog. This entry was posted on July 27, 2012 by Administrator. It was filed under God's Will, Prayer, Tabernacle, Walking with God and was tagged with Aaron, Altar of Incense, daily offerings, Exodus 30, God’s kingdom, Holy Place, Inside the tabernacle, Intercession, John 15, Messianic, Mishkan, pleasing aroma, priestly duties, renewing of your mind, Rev 8, Rom 12, spiritual perspective, tent of meeting.